Would you like to export your forms from your current site and import them on another? 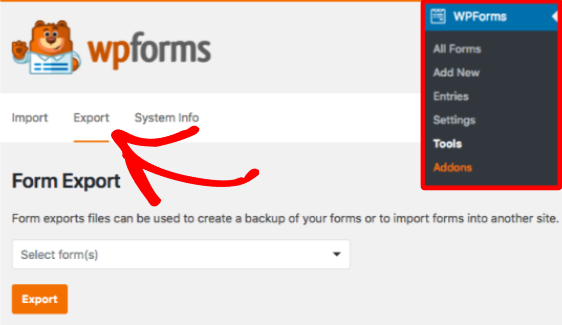 The Import/Export tool in WPForms gives you the ability to migrate your forms to a different site so that you don’t need to restart from scratch. In this article, we will show you how to use the Form Import and Export feature for WPForms. To access the Import and Export tool, you’ll need to go to WPForms » Tools. Once you’re there, select the Export tab. Once in the Export tab, click on the Select form(s) dropdown. You will then see a list of forms that are available for export. You’ll need to then select the form(s) you wish to export, then click the Export button. To begin import a form, click on the Import tab. Then, you’ll need to click the Choose a file button to select a file from your computer. Once you’ve chosen a file, click the Import button. Once you have successfully imported the form, a notice will appear to provide a link to the Forms Overview page where you can see your import forms. You’ll need to click on your imported form to start editing. That’s it! Now you can move forms across sites using import and export in WPForms. Next, would you also like to create a custom form template so that you never have to start a form from scratch again? To learn more, check out our tutorial on creating custom form templates.